It happens every year. Somewhere between Friday the 13th and the Winter Solstice on 21st June we watch the weather patterns for the perfect day that will take us back to Yoho Beach. That type of day where the sky is just a haze, sea the colour of ink and the horizon almost indistinguishable, is when we return to continue our research on Yoho Beach. During summer we often paddle past Yoho beach, which lies in Gulf St Vincent just a few kilometers north of the gulf’s entrance at Cape Jervis. 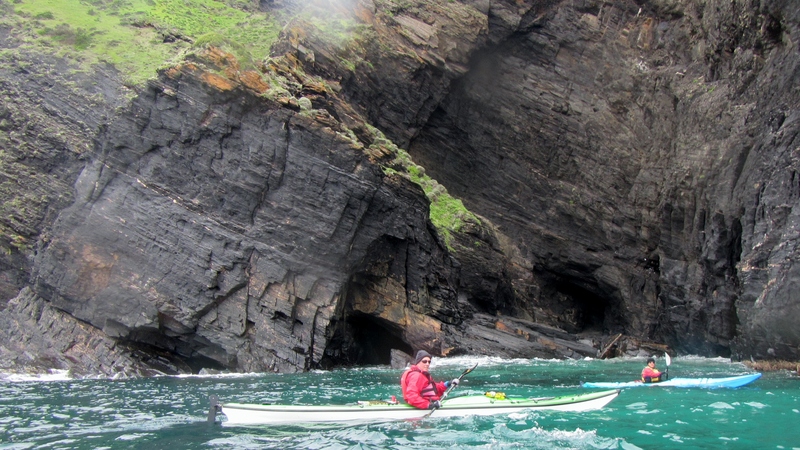 It’s a lovely place to paddle on a warm summer day, passing along the rock strewn coastline, looking at the abundant bird life and keeping an eye out for the local dolphin pods but the swells are rarely low enough to land. But in winter at the appointed time we return to continue our study of the mysteries of Yoho Beach. 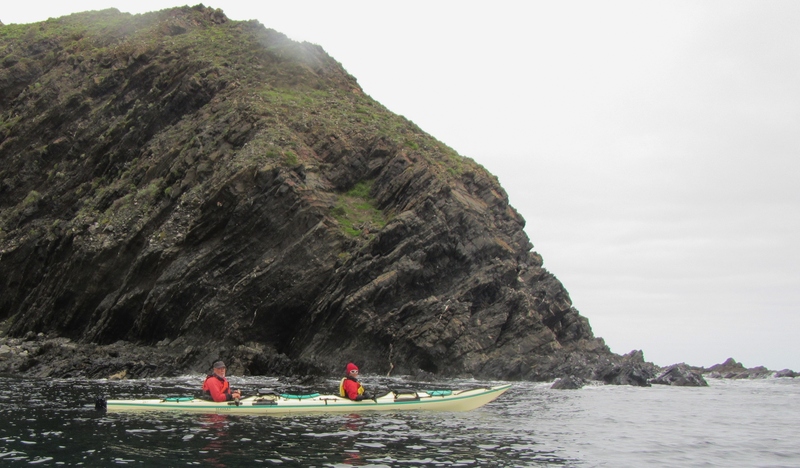 We set off from Rapid Bay for the hop along the coastline passing the towering cliffs of Rapid Heads and enjoying the frolicking seals. The water is calm, dark and certainly deep as we round the headlands. Paddling along this area is always eventful, especially when you get in close to the cliffs and ride the surging waves as Michael soon found out. After a while the Headlands of Yoho come into view, with the winter grasses blanketing the slopes. It’s an odd place, sort of eerie, a strangeness that creeps up on you every time you land there. You always feel like you are being watched by someone lurking on those bald rock strewn hills; but there is never anyone there. Like someone is looking over your shoulder when you wander along “beach combing” the area, but I’ve never met anyone else on the beach and know of only a few people who ever stop there to explore or enjoy lunch on the grassy slopes. This year we bought with us “Professor” Rodney B., a newcomer to this area, who could hopefully cast more light on the strangeness of Yoho. 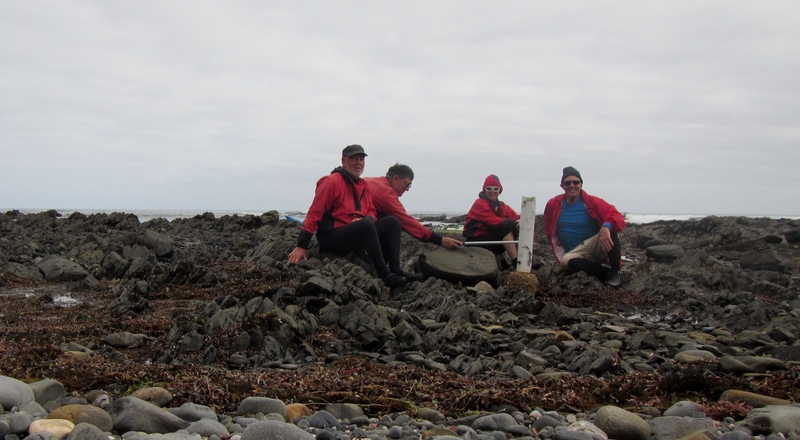 We carefully landed in the small channel and came ashore. An ancient rock wall stands guard halfway along the beach, it’s purpose long lost and the people who built it long departed. A small creek winds its’ way to the ocean making an excellent habitat for local fauna. 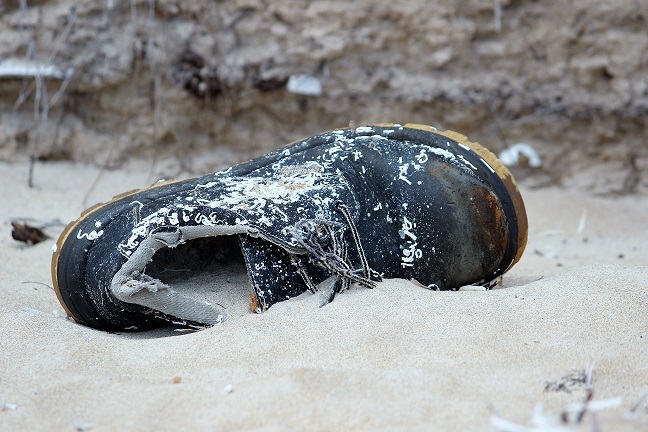 The first sign that something was different here was what we found when beachcombing. Left foot thongs. Never a right, only a left. Some people call them Flip-Flops others Sandals but in Australia they can only be Thongs. Over the years we found some with Asian branding, some with English, a few with German and Arabic, some near new, others with the imprint of the previous owner well worn into them. All sizes, all shapes, all left foot they magically came to be washed up on this lonely beach. 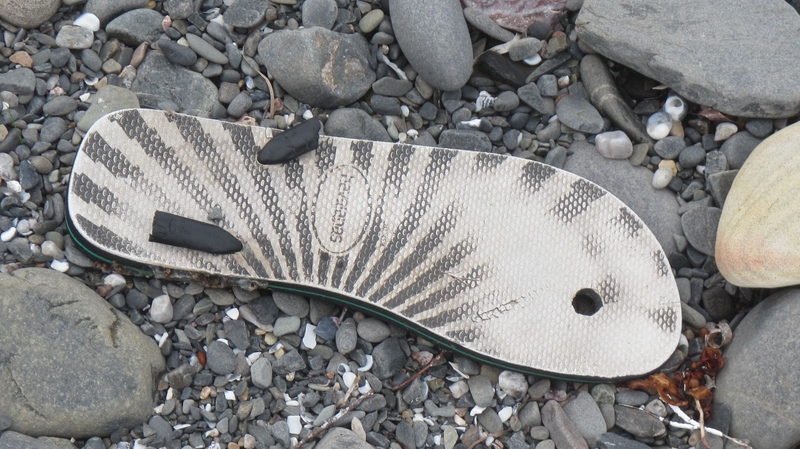 We kept returning over the years to see more thongs as well as a scattering of other shoe styles, still all left foot, and recently we have been coming across more left foot Crocs wedged amongst the rocks. 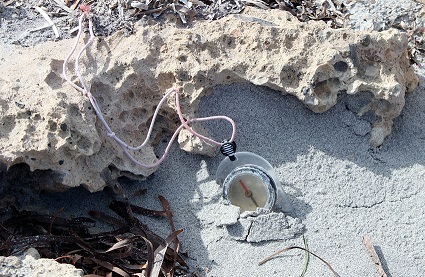 We have even picked up a compass, it was probably discarded as it too pointed Left. 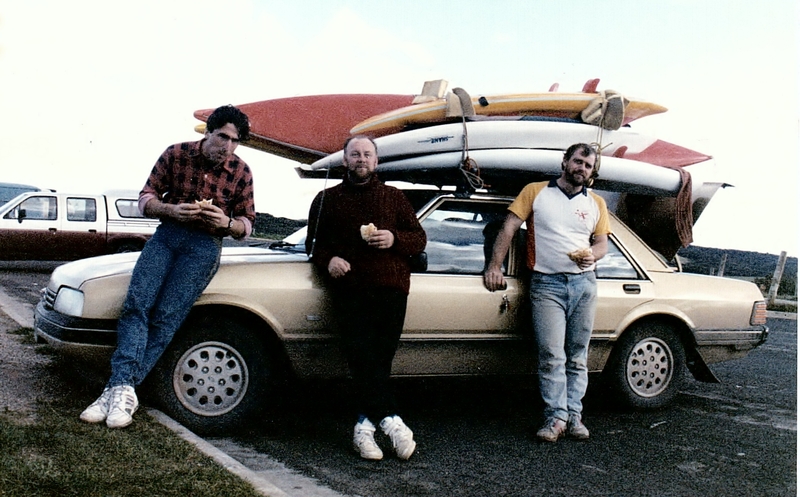 We often gathered with a nice bottle of McLaren Vale Shiraz and wondered about this place. We pored over tidal flow charts looking for answers and even started taking measurements in the area. We erected markers next to rocks so that they could be measured each year. Over the years we found that they too were wearing more on the left side than the right. The wind is also strange here, no matter which direction you turn it always comes from your Left. 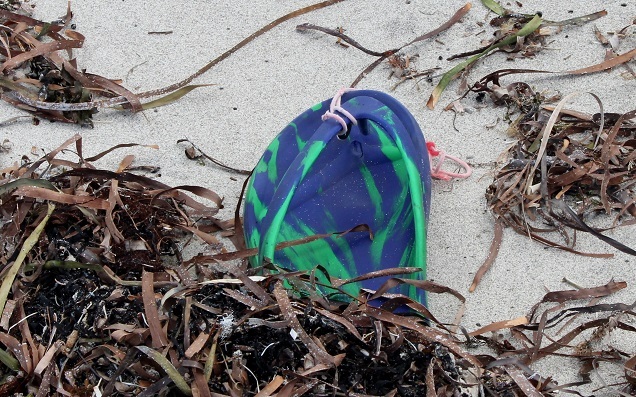 Is it the unusual dodge tides that frequent the gulf that allow only left footwear to come ashore and why not the right as well ?. Is it the high pressure cells that pass through over summer, rotating in an anticlockwise direction ?. Is it a stranger phenomenon, something that we don’t understand about this lonely beach ?. Recently I was sorting some old camera equipment and saw my old Minolta waterproof camera that I had used in the 1980’s and when I found it still had film I decided to have it processed. 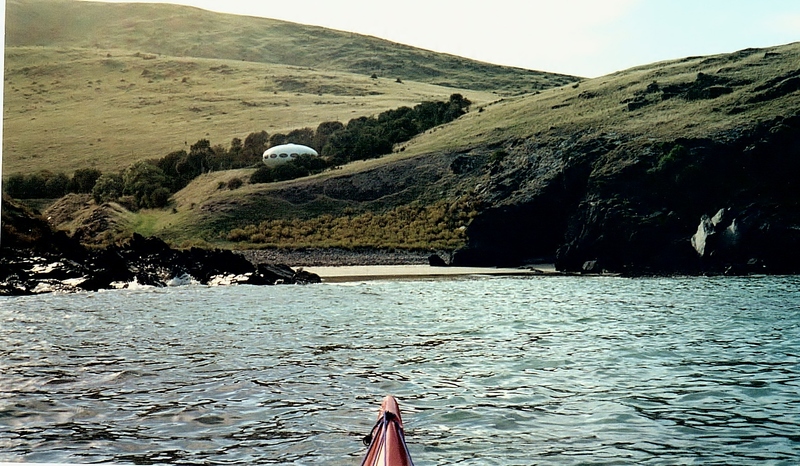 The pictures were of sea kayaking and camping near that beach. An early visit to the area. camped on a rocky beach near Yoho. And then there it was. Maybe the answer to the riddle of Yoho beach partly hidden in the trees. Ian, Robyn, Michael and “Professor”Rodney B. Guess who’s got a new Cagdeck ? Super comfortable, lightweight and of course fashionable, yep that’s my new Cagdeck. A combination spraydeck and paddling jacket (Cag). Ok, I do use a Greenland paddle and have occasionally been seen practicing my rolling off the local beach in winter, but I think I will draw the line at wearing the traditional Greenland Tulik (Tuliq). 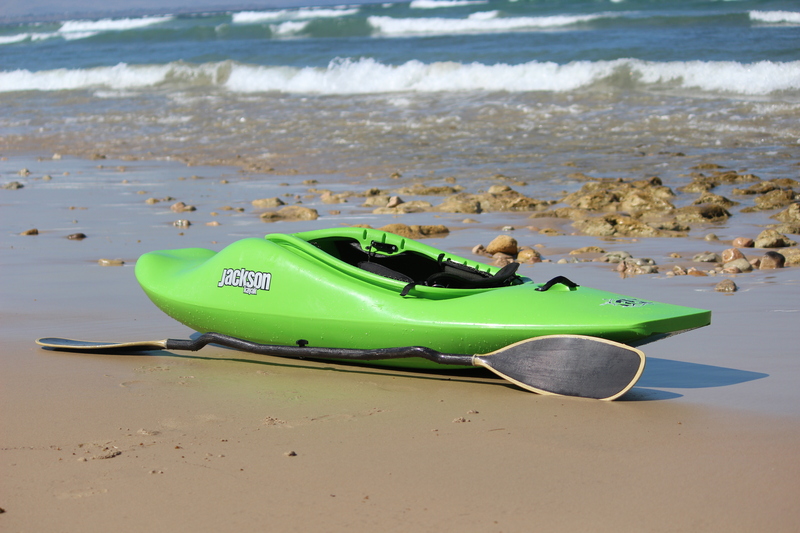 The most active paddlers in Australian cold water conditions are slalom and rodeo paddlers and I found that the top paddlers in that arena all seem to use a one-piece Cagdeck instead of a separate spray deck and paddling jacket (Cag). I talked to a couple of coaches who spend considerable time on the water and they were sold on the Cagdeck combination for maximum dryness and comfort. So it was a Cagdeck for me. The standard spraydeck and Cag meant 2 layers of neoprene around my waist which I found a little restrictive and sometimes uncomfortable. On a longer paddle the Cagdeck is more comfortable and allows different layers to be worn underneath without feeling too bulky. 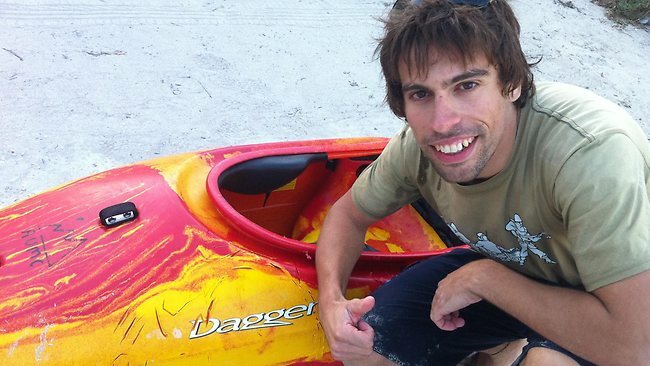 In the surf kayak, where I spend a lot of time getting wet, the more comfortable waist also allows easier movement and therefore harder turns and often some panicky support strokes. If you happen to be practising rolling in cold water then simply add a neoprene diver’s neoprene hood for extra warmth. Cagdecks are mainly available in small cockpit sizes because they are made for the competition slalom kayaks and they will fit many of the Greenland style kayaks but I couldn’t find one big enough to fit my Nimbus Njak sea kayak. 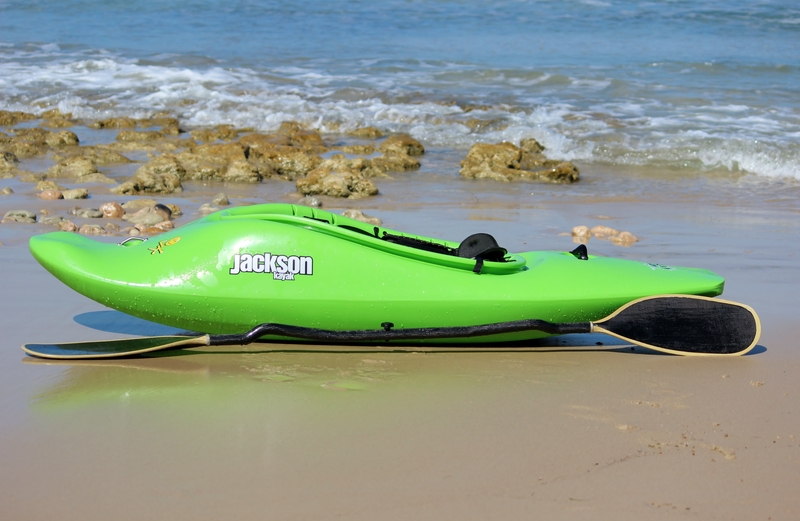 Luckily a couple of phone calls and I had one being custom made through Liquid Life kayaking gear. I even did a paddle along the coastline, stopping in for a coffee at a café and yes there were a couple of strange looks at my paddling attire, but try that in a Tulik and you risk setting off the armed robbery alarm. 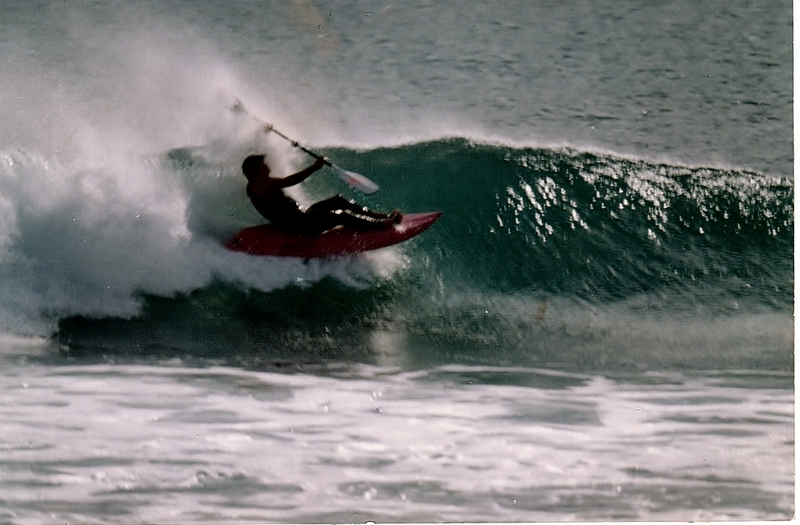 Check out some of my happy cagdeck surf kayaking photos at the bottom of the page. 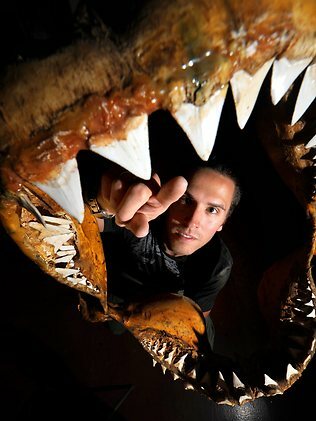 I just read the latest research on the Shark Shield electronic deterrent device by Government researchers. Unfortunately the research was done in my back yard so to speak, with tests conducted off the Neptune Islands of Southern Australia. This is not far from a few recent paddling trips to outlying islands out of Port Lincoln and to areas around Althorpe Island and Innes National Park. The verdict seems to be that they just don’t work. Now I always had my doubts about these units, even when they first surfaced as the Shark Pod, several years ago. Anyway I ended up with one supplied by the manufacturer to try out . If it worked and I survived it would be great publicity but if it didn’t, well I probably wouldn’t be in a position to complain. I was sceptical, but hey, what if it really worked. 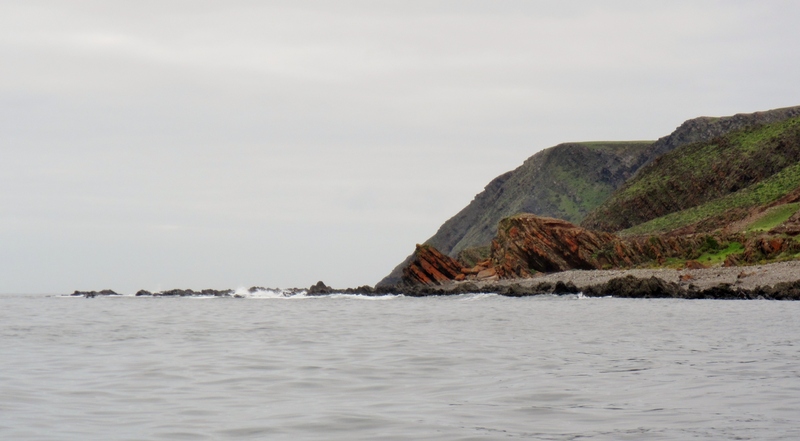 I had been spending a lot of time paddling around the bottom of South Australia and especially loved to snorkel with New Zealand Fur Seals on the Wardang Island group about a 10 km paddle from shore. Great times for both Robyn and me filming seals and friendly dolphins, even with a slightly cumbersome Shark Shield attached to my leg, giving me the occasional electric shock when it brushed against a bare bit of skin. 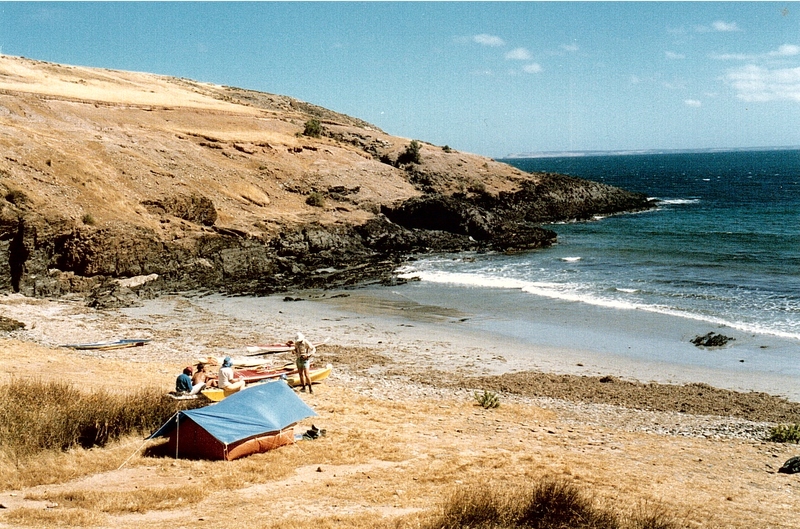 Of course one of my favourite places was Shell Beach in Dolphin Bay part of the Innes National Park . Just lolling about in the clear green water was fun and we often went paddling or snorkelling on the nearby reef. 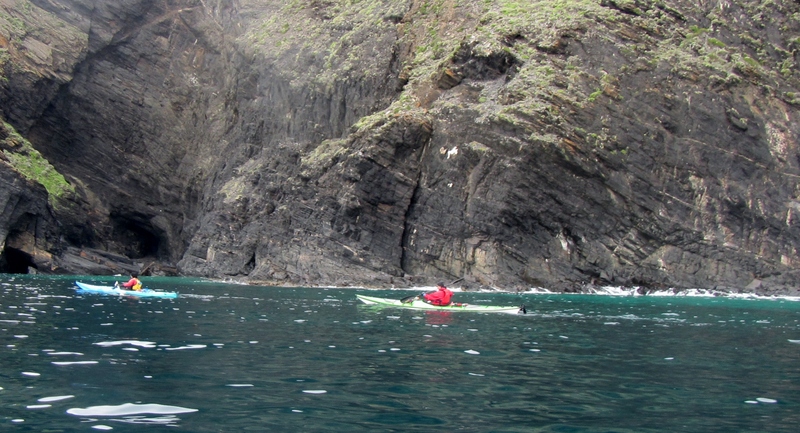 But then this bloody nosy 6 metre Great White Shark started frequenting the area and decided that small kayaks were fair game, and had a chomp on one. The kayak was a Dagger Wiz white-water kayak from the University Mountain Club and luckily the paddler was not seriously hurt in the attack. So what to do now ? Simple, get out there, keep paddling, keep surfing and having fun. Always remember, it’s much less dangerous than my Saturday morning group bike ride. One good thing though. I just removed another piece of superfluous electronic gadgetry from my kayak kit. Maybe that means more room for wine and cheese !! Anyone want to buy a shark Shield ? Great condition, hardly used. At last a couple of decent days of weather in a row. Today was such a beautiful day, clear skies, light winds and we could almost call it warm. I’ve had enough of winter now and my arthritic joints are certainly looking forward to summer. Only one problem with the day; the surf was tiny, however Michael and I were desperate to wet a paddle so we opted for a short blast at our local surf spot. Robyn managed to capture a couple of happy snaps which I’m sure you will enjoy, sitting at your work desk.